Assassin’s Creed Origins is shaping up to be a massive game in terms of exploration, but according to Ubisoft, the size of the game will be especially evident on the Xbox One X version. First reported by Vice, an Ubisoft employee spoke to the enormity of the game that’s easily seen on the Xbox One X. 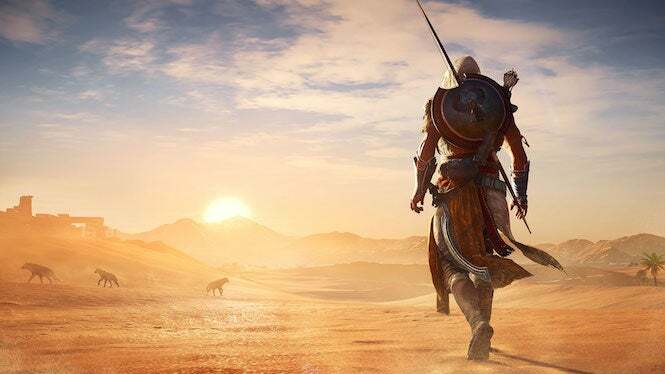 During a playtest of Assassin’s Creed Origins on the powerful new console, Ubisoft’s PR manager David Burroughs attested to how far across the map players could see during their travels throughout Egypt. "See that mountain," David Burroughs asked during the playthrough. "That's there. That's rendered. You can go to it." After making such a claim, there was, of course, a request to go to the mountain. Burroughs responded and said that it was certainly reachable, but it’ll take quite a while to get to reach it. A map that was pulled up during the playtest showed a 50-to-60 quadrant area, and everything that was immediately visible in the surroundings only took up a measly three quadrants on the map. "Well, no, it — that'll take ages,” Burroughs said. “This game is massive. We've basically made the whole of Egypt." For those who are worried about your game being smaller if you aren’t playing on the Xbox One X, don’t worry about getting shorted in terms of content. The game’s the same size across consoles, but the Xbox One X seems to allow there to be more of the game shown at one time. The power that the Xbox One X possesses allowed for more objects to appear in the distance, though as the evidence from the playthrough indicates, it’ll take quite a while to get to whatever you might see on the horizon. This isn’t the first time that Ubisoft has boasted about the enormous size of Assassin’s Creed Origins, but it’s an impressive anecdote of how large it really is. While the main focus of the game will likely remain geared towards the story and the combat, Origins players will stay busy exploring for quite a while. Note: If you purchase one of the awesome products featured here, we may earn a commission. Assassin’s Creed Origins releases on Oct. 27. Currently, Amazon Prime members can save 20% when they pre-order.